A box of cardboard pieces all jumbled up, a beautiful picture on the cover of the box, and nothing but time to create order where chaos is currently residing. This is my idea of a fun time, putting together a jigsaw puzzle. In my younger days I remember being so proud I put together the fifty piece puzzle. It was always a sad moment to disassemble the pretty picture. That sadness only lasted a little while because another puzzle was waiting for me. I don’t know what it was that drew me to this obsession, but it filled the time when my friends were away on vacation, grounded, or otherwise occupied. How do you approach a puzzle? I usually dump the whole box out on the table. Then I smooth it out so they weren’t double stacked. As I am getting it into a single layer, I set aside the straight edges to create the border. Once the border was complete, I would focus on the main object. the one that was the easiest to construct. On and on it would go until there were no more pieces to fit. I love to run my hand over the top and feel the smooth but yet it is bumpy with each piece. Recently, I have learned a new process to approach a puzzle. Sometimes I get to stay with my father-in-law when I am out of town. (It is so much better than in a hotel.) Two weeks ago when I left he had a puzzle sitting on the table. His neighbor had given it to him because she gave up. It has 2,000 pieces. It is 26.5 x 38.5 when constructed. That’s one big puzzle! He was contemplating starting it. 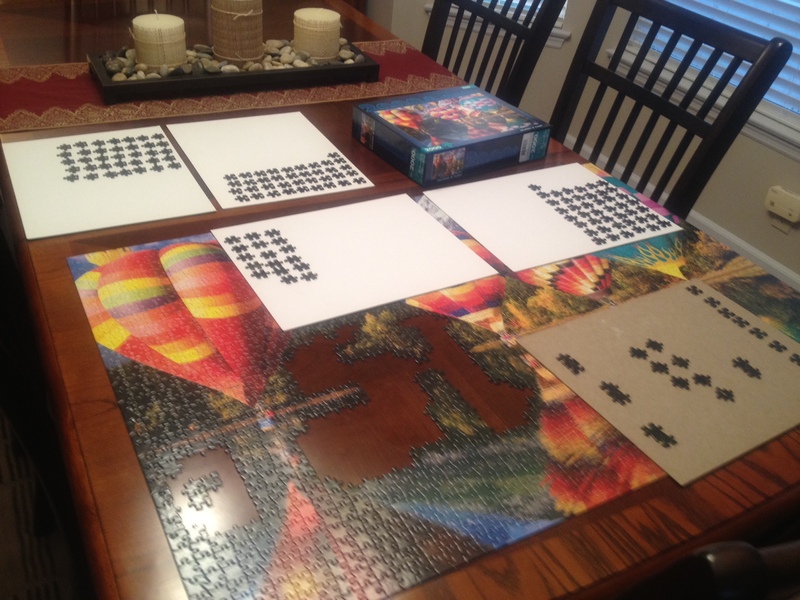 “When I start this I will have to sort the pieces on paper plates.There isn’t enough space on the table to hold the puzzle and the pieces,” he told me. As I left I marveled that he had a plan to deal with this monstrous sized puzzle. I doubt I would have thought of that. I would have followed the only plan I know. I would have had a mess and felt frustrated when I couldn’t find pieces. I probably would have given up, like the neighbor who gave him the puzzle. The puzzle was nearly finished. The only pieces left were black. He has sorted the pieces by shape on each of the cards. Now all he has to do is find the shape to fill in the holes. Brilliant I thought. I always avoided puzzles with a lot of the same color, but this process made so much sense. When I returned in the afternoon, it was together. He thought ahead and developed a plan. 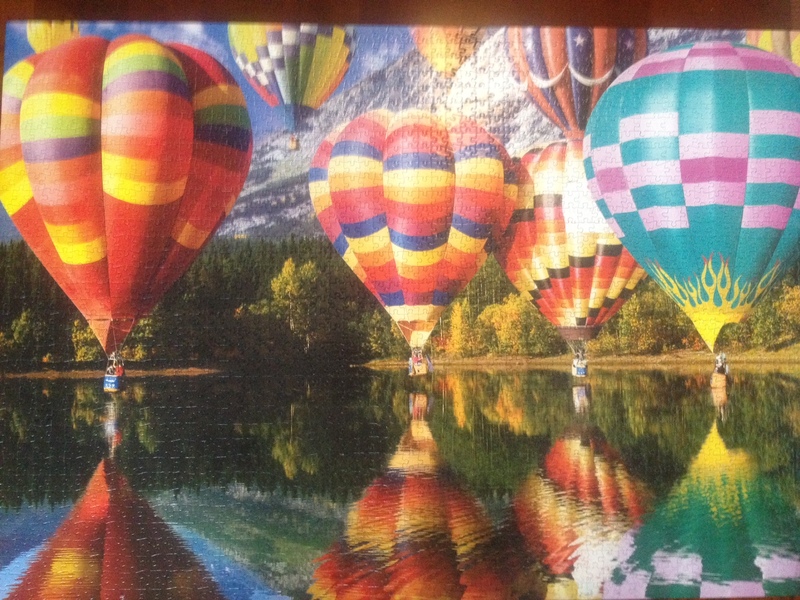 It enabled him to assemble a 2,000 piece puzzle in a short amount of time. He is anxious to share this completion with the neighbor who abandoned the puzzle. So there will be an unveiling of the masterpiece, then back into the box it goes. I wonder if the neighbor will take it out to see if she can do it too? Can You Get Something Great from a Mess? Crafts have always been something I’ve enjoyed. As a child I loved making stuff. I would look at magazines and books and create bookmarks, bookends, name plates, and many other crafty things. This passion for creating continued to more complicated crafts as I grew older, such as quilling (click to see info from Wikipedia), crewel embroidery, plaster crafts, and even creating plastic flowers by dipping shaped wire into some kind of liquid plastic that dried hard. As a poor teacher, I supplemented our “fun” money by painting wood cut outs and selling them at a craft fair every fall. This enabled us to join the family on Christmas ski vacations in Steamboat Springs every other year for a period of time. I have cross stitched, needlepointed, hooked rugs, and stamped cards. Wow, now that I have written this out I think that’s a lot of crafts, and I have probably forgotten some. 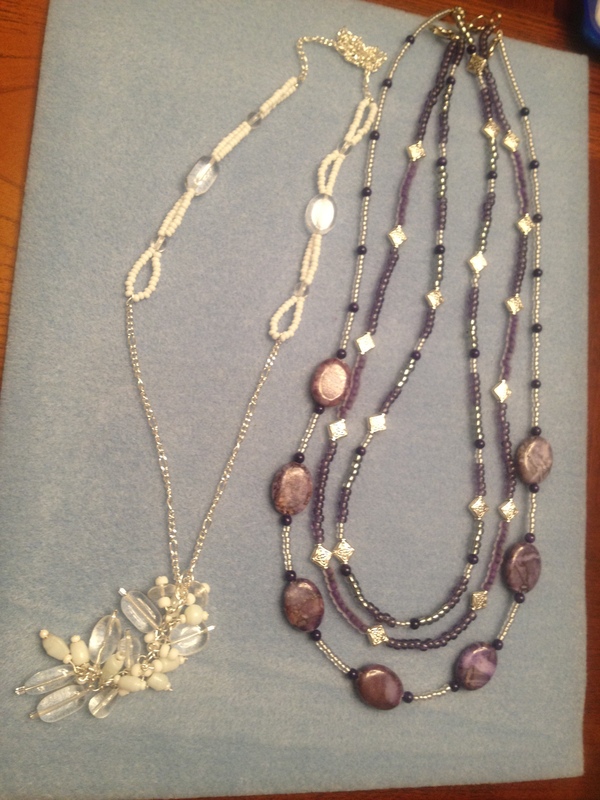 Currently my interest lies in beading. I mostly make necklaces, but I have done a few bracelets. Chico’s and Coldwater Creek are really to blame for this current interest. I liked some of their jewelry, but didn’t want to pay the price. My friend said you can make this. I’ll show you how and that was the end of that. I now have a tote with lots and lots of beads (mostly stones of some sort). I’m sure it would have been cheaper to pay the price for the store’s jewelry, but where would the creative pleasure be? this stone look with this metal piece? Or what about this seed bead, can I use it somewhere? Oh yeah, these are nice, how can I use them? So . . . sometimes I have a dining table and a few evenings available. I create a mess! (Good thing I am there alone.) Note that even in beading I need a mentor text (i.e. page ripped from Chico’s catalog). 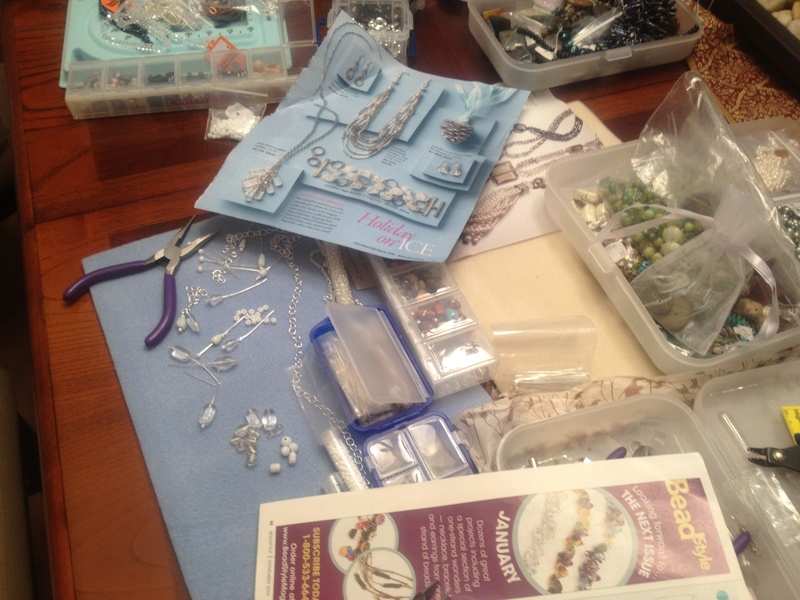 As I sat there stringing and restringing the variety of beads, stones, and metal spacers, I thought this is just like writing. You have to get in there and play with the words to create the message you want the reader to understand. Move this word or sentence here and this piece flows better. Take this part out, it doesn’t fit. When you are finished with making a mess, you have a wonderful piece of writing or just maybe a cool necklace! M-m-m-m, oatmeal with brown sugar are just what a body needs on a damp, cold Monday morning in a hotel far from home. I am sipping my coffee, blowing on the spoonful of creamy warmth as I peruse the USA Today front page. Several people have arrived in the dining area. They are milling about the breakfast area making their choices for the first meal of the the day. All of a sudden, I begin to notice activity in the waffle section. Two men are standing around, making comments on the news story above their heads as the wife of one man comes over, “What are you doing?” she inquires of her husband. “I thought I’d have a waffle,” he replies. She glances over to the waffle irons. “Did you put batter in it and turn it over?” wife asks. I believe she already knows the answer to this question. Exasperation with head shaking describes the wife, as if this is not an unusual response from her husband. “You have to put batter in the waffle machine, then flip it over. The timer will beep when it is ready.” she says in a very calm voice. “Oh, I guess I would just have been standing here a while if you didn’t come over here.” he says with a laugh as he watches his wife pour the batter into the waffle iron and flip it over. She walks away before the timer beeps. Her breakfast is getting cold. After the waffle iron beeps, he is able to wrestle the waffle to his plate and join his wife at the table. I suppose the wife has always done it all for her husband. This makes him helpless in new situations. I remember this scene when I am working with kindergarten teachers today. They have a difficult time believing that their students can be successful and independent in writer’s workshop (after all they are only five). I continue to sing the song,” Kindergarten’s Can Do Writing Workshop.” You know the tune, it all starts with a belief that your students have something to say. Today I brought thinking by Katie Wood Ray, a blog post by Katie Keier (Catching Readers Before They Fall), and another blog post from a kindergarten teacher, Mrs. Wills to try to convince them kindergarten students can write books. Not just they can, but they should be writing books! If they (teachers) always do the thinking for their students, those students will still be standing there waiting for someone to tell them what to write. I hope my message made them think about stepping out and giving this a try with their students.